← How to Play 720P/1080P HD Video on Sony Xperia Z5/Z4/Z3/Z2/Z1? MKV files is widely used as a high-definition video, it supports multiple streams of video, audio, subtitles and metadata. However, MKV is not so compatible with neither portable devices nor video sharing sites like YouTube, Facebook, Vimeo, Yahoo, etc, when you try to upload a MKV file for sharing on Facebook with your friends around the world, you may always end up with failure since MKV files is not an ideal online video sharing formats for Facebook. Although Facebook supports all video file types, but the website recommends its users to upload video in MP4 formats. The main reason is that MP4 file are small file size compressed with high quality, in addition, unlike MKV file, MP4 file are more compatible with both media players and websites. To ensure a fast and smooth video uploading process, make sure that the video length should be less than 45 minutes and the file size should be small than 1.75GB. What’s more, upgrade your web browser to the latest version and use a powerful network. To convert MKV files to MP4 on Mac, free download Pavtube Video Converter for Mac, which can effectively convert MKV files to Facebook best preferable uploading formats MP4 on Mac in just 3 steps. Besides that, to make the video more suitable for uploading, you can use the trim function to shorten the video length or downscale it to small file size for fast and fluid uploading. How to convert MKV files to MP4 for Facebook uploading and sharing on Mac? Step 1: Add MKV files. Launch the programs on the computer, click “File” > “Add video/audio” button to add one single or more .mkv files. 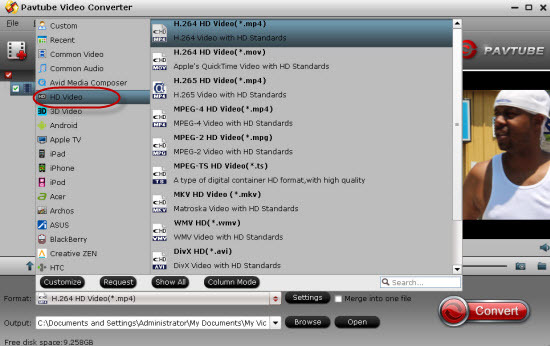 Of course, you can also import other file formats to this Mac video converter. Step 2: Choose MP4 as the output format for Facebook. Click “Format” drop-down list to select output format, here we choose “Common Video” > “H.264 HD Video (*.mp4)” as the output file format for Facebook uploading. 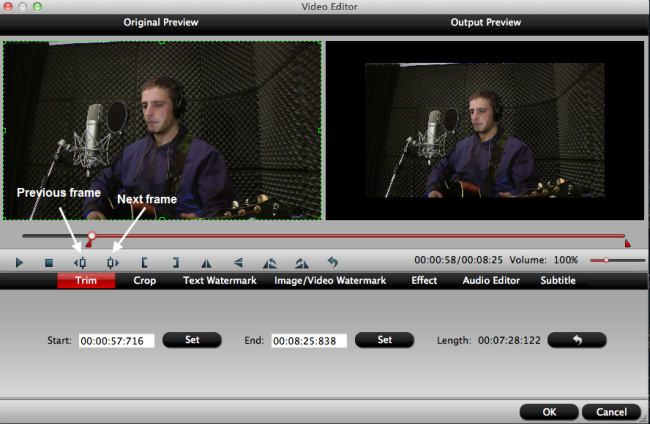 Step 3: Trim MKV video clips. Open “Video Editor” window, go to “Switch” tab, here you can drag the slider bars to set the start time and ending time to selected the clips to be converted. Step 4: Convert MKV to Facebook supported file formats. After all the setting is done, hit right-bottom convert button to start MKV to Facebook MP4 converting process. When the conversion is completed, you can easily upload and share MKV files on Facebook, YouTube, Vimeo, Yahoo and other online video websites.